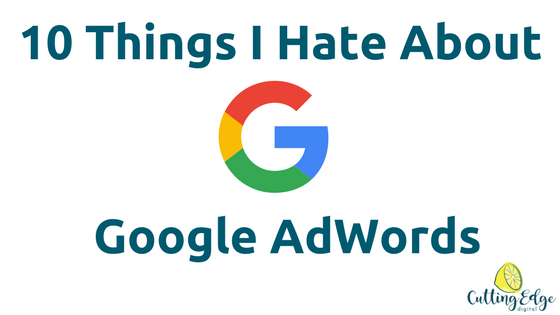 Yes, you read that right – I’m going to talk about 10 things I hate about Google AdWords. Don’t get me wrong – I LOVE Google AdWords. It’s an amazing platform for many businesses (not all businesses though) to drive quality traffic to their website and result in sales. However, it’s also a platform when not used correctly, can result in business owners getting frustrated at the lack of quality leads, poor conversion rate and, the thing that hurts the most, a complete waste of money. This is the default campaign setting when you set up a new search campaign. If you don’t know any better, you’ll trust Google and leave this setting as is. But this will result in a massive waste of money as your ads will appear not only in the search results, but also across the display network – on random websites in random places – where no one is actively looking for your product or service. Did you know that Google is able to bid up to 20% more per day than your set daily budget? So if you’re bidding $20 a day, you may actually end up spending up to $24 a day! If you’re constantly spending more than your daily budget, you need to look at reducing your daily budget to account for Google’s 20% overspending allowance. So you’ve set your keywords to phrase match? Awesome! But Google can still show your ads to similar keywords if they think it’s relevant! Nothing you can do about this really – adding ad group level negative keywords can help but it depends what your keywords are and how you structure it. If you aren’t sure about what you’re doing here, it’s well worth speaking to a Google AdWords specialist. Display ads are great for reaching people when they aren’t actively looking for your product or services. But did you know that Google serves a ton of display ads within apps? Anyone who’s used a free app will know that sometimes it’s impossible to get rid of an ad without inadvertently clicking on the ad. Then you mutter some swear words under your breath and click the close button as soon as you can, but it’s too late, that advertiser has paid for that click. This is one reason why I always exclude mobile apps as a placement for display campaigns. In the last few months, Google has started to reduce the data they provide in their keyword planner tool. This was one of the most invaluable places to get data on what keywords to use in campaigns. However Google has started grouping keywords together and also not giving you data unless you spend a minimum amount each month (which no one is quite sure what the minimum is either!). Thanks a lot Google. This one makes me laugh – I almost never use the opportunities that Google suggests – it will come up with new keyword ideas and 99.99% of the time they are so irrelevant to the campaign it’s ridiculous. So please don’t trust Google when it comes to what keywords you should be using. Another metric to take with a pinch of salt – these aren’t always accurate, especially when you’ve just started a campaign. Don’t let Google bully you into bidding more per keyword than you’re comfortable, at least to start with anyway. Let it run for a few days and try to accrue some data and clicks before increasing any bids to Google’s bid suggestion. This one does annoy me as usually it’s the majority of your search terms data. Google won’t tell you the search terms which you’re getting clicks on – how rude right!? You’ve paid for these clicks but you’ve no idea what the search terms were. There are some ways to try and get this data but they generally involve paid tools and probably deserve a whole separate blog. This is the default keyword match type setting – and it’s the biggest way to waste money. To explain how broad match works, let’s say you’re a baby shoe shop. So you set up the keyword ‘blue baby shoes for boys’ as broad match – because that’s the default from Google so it must be right! Right? Wrong! Setting that search term to broad match means your ad can show if ANY of those words match the search term. So in this case, your ad may show for search terms like ‘red high heel shoes’ because the word shoes is in that search term. Or your ad may show for ‘blue baby onesie’ or ‘denim jeans for boys’ or ‘buy women’s shoes’. NEVER use broad match! If you’re wanting to start using Google AdWords and you know you’re not skilled enough to set it up yourself, you can sign up as a new customer and Google will set up your accounts and manage them for 3 months for you. FOR FREE. Sounds amazing, doesn’t it? Well you guessed it, you may be wrong! The Google team who does this has a vast range of knowledge, so you may end up getting someone who knows as much as you do. They also use a lot of the default settings and broad match or broad match modifier so you will probably still end up wasting a heap of your hard earned marketing dollars. You’ll get to the end of the 3 month trial, and feel like there is no benefit from using AdWords for your business. If you’ve agreed with any of the points in this blog, or feel like Google AdWords is a bit of a minefield for you, get in touch with me, a specialist in Google AdWords management in Perth, for an obligation free review, recommendations and quote for your business. Excellent article I am thinking about doing an Google Ad but get lost and then end up doing nothing.